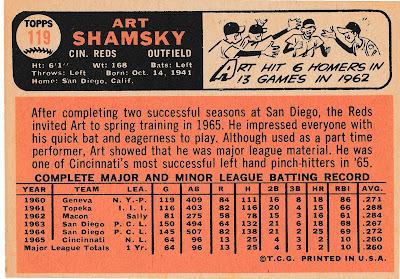 Here is young Art Shamsky, with all of 96 major-league at-bats under his belt. 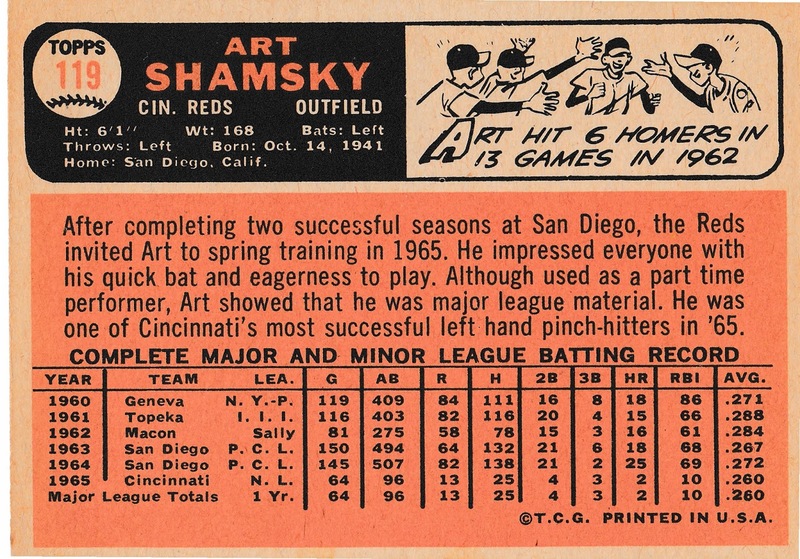 Shamsky was signed by the Reds in 1959, and played in the minors from 1960-64 until making his major-league debut in April 1965. 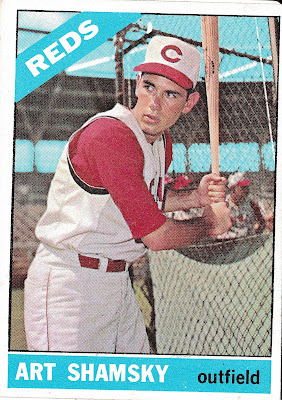 As a rookie, he was the Reds' 4th outfielder, but when the first 3 are named Vada Pinson (159 starts), Tommy Harper (156), and Frank Robinson (154), there's not much for you to do. 46 of his 64 games were as a pinch-hitter only. With the trade of Robinson to the Orioles, Art saw his playing time increase somewhat in 1966. Not too much, as Deron Johnson took most of the outfield time left behind by Robby, with Shamsky making 63 starts. By 1967, Pete Rose and even Lee May were in the outfield mix, so Art found less playing time than in '66. That November, the Reds traded him to the Mets for utility infielder Bob Johnson. Shamsky jumped onboard the Mets' train 1 year before the Miracle 1969 season. He played in over 100 games in each of the next 3 seasons. Sure, the Mets had Cleon Jones, Tommie Agee, and Ron Swoboda, but in 1968 Shamsky started 64 games in left field, and another dozen each in right field and first base. 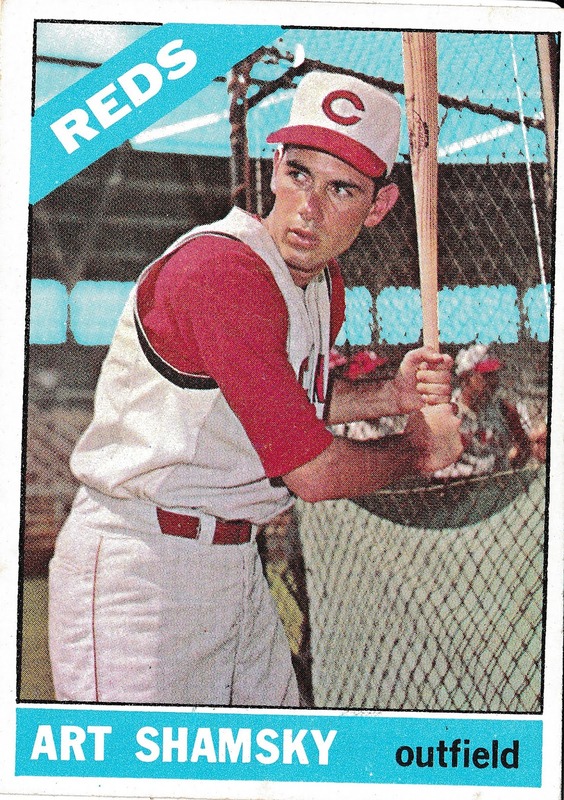 In 1969 he split right field with Swoboda, starting 61 times to Swoboda's 70. Art also filled in at 1B and LF occasionally. He hit .538 (7 for 13) in the NLCS, but was 0-for-6 in the World Series. In 1970 he started 55 games at first base in relief of Donn Clendenon (Ed Kranepool having been sent to the minors), along with another 49 starts in right field. Art's career began to fade in 1971, as he was demoted to 6th outfielder, playing only half the games he did in '70. He was traded to the Cardinals in October 1971, but released just before the '72 season. After his playing career, Shamsky was (among other things) a Mets broadcaster and a New York sports radio host. In the TV show "Everybody Loves Raymond", Ray Barone's brother Robert has a dog named Shamsky. Art even even made an appearance on the show.